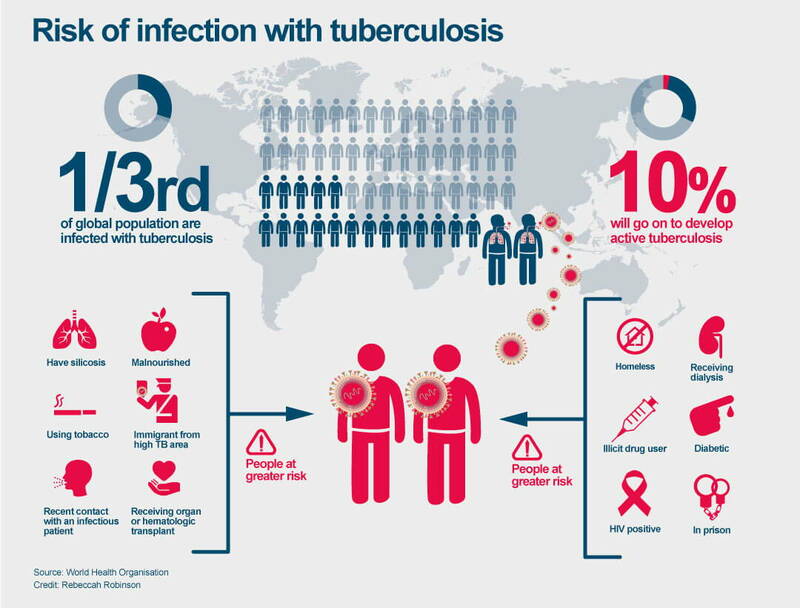 One-third of the world’s population is affected by TB. If exposed to infectious TB, anyone can get infected and progress to disease. Most TB disease is diagnosed in private medical settings with city/county public health departments providing case management support and contact investigations to identify related TB infections and disease. Private providers, working with public health personnel provide prevent large and ongoing outbreaks of TB. The CDC is offering the following web-based CME course, Interactive Core Curriculum on Tuberculosis: What the Clinician Should Know – Continuing Education Activities. Routine testing of low risk populations is not recommended and may result in unnecessary evaluations and treatment because of falsely positive test results. If health system resources do not allow for testing of all foreign-born persons from a country with an elevated TB rate, prioritize patients with at least one of the following medical risks for progression: diabetes mellitus, smoker within past 1 year, end stage renal disease, leukemia or lymphoma, silicosis, cancer of head or neck, intestinal bypass/gastrectomy, chronic malabsorption, body mass index ≤ 20, history of chest x-ray findings suggestive of previous or inactive TB (no prior treatment). Includes fibrosis or non-calcified nodules, but does not include solitary calcified nodule or isolated pleural thickening. In addition to LTBI testing, evaluate for active TB disease. If LTBI Test is Positive and TB Disease is ruled out, LTBI Treatment may be recommended. A TB Self-Assessment Sheet is available to use in your office, clinic or community center. The California Department of Public Health (CDPH) in collaboration with CTCA and the Curry International Tuberculosis Center (CITC) created the following risk assessments to reduce low-risk testing and to find TB infection, in order to treat those likely to develop TB disease to prevent illness. Should those who work with children be tested? School staff and volunteers with frequent and prolonged contact with students are required to submit to this TB risk assessment or choose to be tested for TB at hire and every four years, to protect children from active TB disease and to eliminate TB testing those without risks for TB. A frequently asked questions document is provided. More information about related laws can be found here. BCG, or Bacille Calmette-Guérin, is a vaccine for TB disease. Many persons born outside of the United States have been BCG-vaccinated. BCG vaccination may cause a positive reaction to the TB skin test, which may complicate decisions about prescribing treatment. Despite this potential for BCG to interfere with test results, the TB skin test is not contraindicated for persons who have been vaccinated with BCG. The presence or size of a TB skin test reaction in these persons does not predict whether BCG will provide any protection against TB disease. Furthermore, the size of a TB skin test reaction in a BCG-vaccinated person is not a factor in determining whether the reaction is caused by latent TB infection (LTBI) or the prior BCG vaccination. TB blood tests (interferon-gamma release assays or IGRAs), unlike the TB skin tests, are not affected by prior BCG vaccination and are not expected to give a false-positive result in persons who have received prior BCG vaccination.